Cory’s Story is a book that delivers an inspirational story of one dog’s challenging journey through life as an epileptic. The story delivers heartwarming accounts of Cory’s early days as a puppy, in which Cory was a bit of a “Marley and Me” troublemaker that will have you laughing as you turn each page. 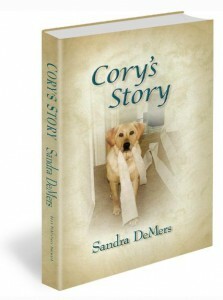 Later in the story, author Sandra DeMers (Cory’s owner) illuminates the dark world of canine epilepsy and illustrates the deep bond between canine and human that eventually leads to Cory living the final 5 years of his life seizure-free. Cory’s Story will make you laugh, and it will make you cry—but not tears of sadness; tears of joy and inspiration. Cory’s Story is meant for all dog lovers, but owners of epileptic dogs will especially find hope after reading Cory’s Story. Prepare to be inspired. Update (3/15/16) Cory’s Story (eBook) is now available on Amazon.com! Perhaps it’s because I lived for over 13 years with an epileptic dog, which makes me more likely to notice these things, but I see blogs and Facebook posts, and people sharing their stories on pet forums where there are overwhelming testimonials about the link between what a dog eats and its effect on the epileptic dog’s seizures. My own dog, Cory, who was a Yellow Lab diagnosed with epilepsy when he had just turned 3 years old, was one of the lucky dogs whose seizures were greatly diminished, and eventually stopped completely, by a change from commercial dog food to an all raw natural diet. At the time, I didn’t care what made the difference, I was simply thankful that the change in diet worked for him. Now, several years after Cory’s passing, I am curious as to why he and so many other dogs with epilepsy have been helped by something that is so simple to do, and yet still meets with such resistance among many dog owners. Why is it that people with healthy dogs find it so difficult to heed the voices that have been raised shouting for joy, proclaiming the message that the health and well being of their dogs changed for the better when the commercial dog food was switched out for a raw, natural diet? It is because we have been brain-washed, from the time we were children in front of the television set, to believe that only the pet food companies have figured out the right way to feed a dog, and if we love our dogs, we want to feed our dogs the right way. A human with a healthy dog will probably not even give any consideration to switching the dog’s diet, because it appears to be thriving on the kibble it currently gets. To that human, I would say that there is also a profound link between cancer and commercial dog food. You see, kibble contains glycotoxins. What may start out as ingredients which were of high quality in their original form become carcinogenic for some animals in the resulting kibble once those ingredients have gone through all of the processing and rendering. (See the forward to “Natural Nutrition For Dogs and Cats,” by Kymythy Schultze). What I have found, that makes the most sense to me, when I look at the possible reasons for a diet to have an affect on canine epilepsy, is this: an epileptic dog has what is known as a seizure threshold. If the dog’s body needs to spend energy in fighting off something that is not good for it, then it will not have the energy it needs to prevent a seizure. It is akin to a human patient with a grave illness being exposed to someone with a cold or the flu. The seriously-ill person is automatically put in a much more serious health situation than a healthy person would be if he or she were exposed to a cold or the flu. The person fighting a debilitating illness may actually die by the exposure to a common virus, while the healthy person may have complete immunity, or recover quickly if he or she does get the virus. In that same vein, if what a dog eats contains ingredients which are not good for the dog’s body, such as the grains, fats, preservatives and chemicals that are found in commercial dog food, then the seizure threshold is lowered, because the dog needs his energy to get rid of the toxins. That is to say, the food itself is causing stress to the body when the dog does not get the nutrition that it requires for optimal performance. Some canine seizures have been linked to a low Vitamin B1 (thiamine) level. This is because the chemicals in commercial dog foods change the hydrogen ion concentration in the intestines so that the dog’s body is not able absorb the thiamine, even when it is added as a supplement. In order to get a diet that is optimal, it is necessary to choose a diet that is as natural to what the dog would eat in the wild as possible. But you do not have to figure this out yourself. There are many companies on the market today which prepare raw diets for dogs and cats which are grain-free, use organic ingredients and are guaranteed to be 100% nutritionally balanced for all stages of life. Not all seizure triggers are food-related, but many of them are. In addition to the commercial dog food, Cory’s seizure triggers included strenuous swimming for long periods at a time and occasionally he would have a seizure right after a full moon. Having multiple seizure triggers is probably the reason why it took Cory’s body five years to rid itself completely of seizures, once we took away the commercial dog food. The more seizure triggers you can identify for your dog, the more you will be able to help him overcome his body’s affinity to suffer seizures.